For a Thai dish--which should be sweet, salty, spicy, and full of flavor--this falls surprisingly flat, which was a pretty big disappointment since I'd been looking forward to making this for a while. I vow to one day make Thai food that's equivalent to restaurant quality, but this definitely isn't even coming close. Sauteed shallots and green curry paste (a little less flavorful, in my opinion, than its red cousin) are simmered with a mixture of coconut milk, basil, and lime zest. 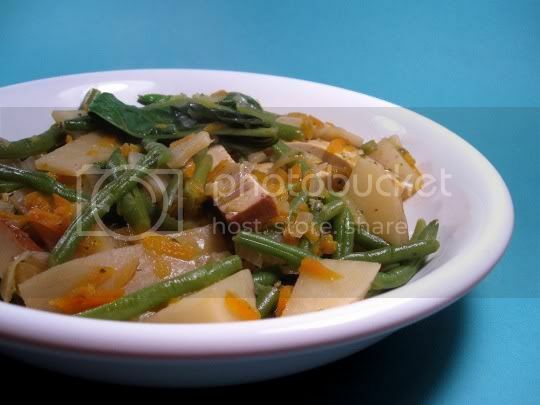 Next, canned bamboo shoots, diced potatoes, shredded carrots, and green beans are added. For some reason, my potatoes took awfully long cook, so unfortunately the bright green of the dish was lost. Sliced baked tofu and soy sauce are added toward the end: I was hoping the soy sauce would kick in some richness and salt, but it didn't. You'll definitely want to start adding some extra seasoning: more salt, more heat, or maybe even an extra teaspoon or two of the curry paste. Something! The bamboo shoots, however, did add some tang to the dish, and I really liked the firm yet tender texture of them. Although the potatoes do add some starchy substance, this is more of a complete meal if served over rice. Overall, the dish does have nice flavor (the lime, basil, and coconut milk really are a nice combination), but it's definitely missing something more...you've been warned. Make again? Probably not. It was a good, satisfying meal...but I'm in search of the ultimate Thai feast!